We live in a deeply divided world. Significant shifts in global economics and geopolitics have meant that countries are desperate for economic growth and increasingly intolerant of any events that derail them from achieving their targets. In this milieu, migrants have been caught in the crossfire. No one seems to want them, but what’s more, the unwillingness to include migrants has severe repercussions on how nations are planning, managing and financing their cities. At Prepcom3 in Surabaya, Indonesia in the last week of July, I was disappointed to see India join the European nations and the United States to object to the inclusion of the Right to the City framework in the New Urban Agenda, which will be further negotiated by United Nations member states in New York a few days from now. Allegedly (see Indian Express report), while Europe’s concerns stems from the migrant crisis and the US is loath to recognize immigrant rights, India is also worried about the repercussions of taking on the responsibility to provide social justice to all, extending the already thin benefits of State welfare and largess to those who might not be legally recognized citizens. This is the heart of the problem. In a policy environment in which the word ‘inclusive’ is bandied about rather casually, the meaning of inclusion bears repeated and deep exploration. Gautam Bhan put a spotlight on this issue of citizenship recently with reference to the Delhi Jal Board’s historic decision to provide universal access to water. Who does India consider illegal and what are the various kinds of non-citizenship that people experience has been a subject of much study. Internal migrants, despite a Constitutional right to mobility anywhere within India, have been described as ‘illegal’, ‘encroachers’ and ‘polluters’ in numerous policy documents and court judgements. Even where policy has recognized their economic contribution, migrants have been steadily excluded – or inadequately considered – from provision of basic services (like water, sanitation), housing (negligible supply of affordable housing, no focus on incremental housing), transportation services (low priority to affordable public transport including NMT), health, education, subsidized food (no access to PDS at destination) and even conditions for livelihood (harassment of street vendors, regulations that prevent home-based work). The good news is that this seems to be changing. We can see now the very humble beginnings of a new mindset that sees migration less as an intrusion and more as an inevitable consequence of economic transition (and climate change). Parliamentarians have been debating migration in a more healthy manner and that has resulted in the creation of a Working Group on Migration particularly to assess linkages with housing, infrastructure and livelihood. I understand the debates within this group comprising several ministries and government department, academics and industry representatives have been encouraging. Besides changes like the Delhi government’s inclusive stand on water, there is much progress in the field of housing as well. At a consultation co-organized by the Ministry of Housing and Urban Poverty Alleviation (MoHUPA) along with Magic Bricks and GIZ this past week, I was pleasantly surprised to see not only more supply of lower income group (LIG) and economically weaker section (EWS) housing by state governments (representatives from Rajasthan, Maharashtra, Gujarat and Tamil Nadu spoke), but also much movement on progressive housing policy. This morning’s interview of Mr Sriram Kalyanaraman, MD and CEO of National Housing Bank, who also spoke at the event, offers much hope. We see the confluence of the government’s flagship housing scheme Pradhan Mantri Awas Yojna (PMAY) and technology solutions (e-gov, m-gov, intergated MIS) that work to educate housing buyers and link them with accessible bank branches. The uptake of low ticket size home loans is especially encouraging. Kalyanaraman reports that home loans for under Rs 10 lakh comprised a whopping 30 percent of the total in FY 16! I have a personal sense of victory in this regard, having been involved with organizations like mHS City Lab that persevered long and hard with the government and finance sector to push changes that allowed banks to devise means to underwrite loans to informal sector workers. A huge change indeed that will have rippling effects going forward. MoHUPA’s support of rental housing and attempts to bring in some policy reforms to encourage it are also heartening. Particularly brave are its efforts to understand the informal rental market, for any discussion that talks about the middle ground between the formal and informal pushes us towards a deeper understanding of how human beings survive, negotiate realities and experience the world; the exercise reveals the limits of defining people through their economic functions and shifts the focus on aspects of human dignity, safety and livability. Even more, it shows us that our understanding of their economic realities is also deeply flawed at present. These discussions are critical if we are to move towards long-term inclusive growth. And so, even as we celebrate the early wins, we need to highlight the contradictions in our approach. For example, those in the field know that any discussion on subsidized housing inevitably leads to the question of tenure and title. This consultation was no different. One cannot logically argue with the traditional defense of no-sale and no-lease clauses stipulated for a period of time (5, 10, even 15 years). This defense rests on the logic that people have no right to profit from something the government has subsidized entirely or partially. But if we happen to be in that moment when we are looking at market realities and the reality is that mobility of labour is a defining feature of India’s (rather painful) structural transformation, isn’t it a tad discriminating that we continue to devise schemes that tie the poor down to a specific location, disallowing them full tenure and denying them rights to sell or rent their properties? Is there no way around this? Could rent-to-own schemes be a solution so that the poor pay their way to ownership if they want to? Could private sector rentals that are currently in the informal domain be legitimized and even supported by mutually developing frameworks that ensure minimum quality standards and provide mechanisms to redress grievances? Any number of questions come to mind, but if the government were to truly engage, solutions are also just as many. Beginnings have been made and now its a question of innovation, experimentation and perseverance. I am not terribly excited by conspiracy theories. But when reality stares at you in the face too often and reality resembles a gigantic conspiracy theory, it is hard to ignore it. And that’s when life gets exciting! I had my curtain raiser moment this morning, when I was attending a discussion on JNNURM and Indian cities this morning in which a group of very credible citizens and activists from Gurgaon were interacting with experts from rating agency ICRA to see how data could help influence a more robust citizen movement to improve this city. What made this morning’s experience different from other presentations was the clarity it offered on core issues that have bothered me for a while. In our sector, we constantly run into systemic issues. Working with the government and running up against non-transparent ways of functioning is one source of frustration, of course. But more than that it is the growing awareness with every assignment you work on, that every inefficiency is part of a carefully orchestrated alternative system that is designed to render the official processes non-functional and redundant. This is certainly true of Indian cities. As an entity, the city is getting short shrift in the Indian bureaucratic and political system. Despite being of enormous importance, cities are largely poorly governed, lagging behind in infrastructure and offer low quality of life and poor efficiencies. Why are cities such a low priority for state government despite the growing importance of the ‘urban’ as a source of income and growth? If urbanization is a reality, as we know it to be today, why are city governments not more autonomous and powerful? Why is the Mayor a persona non grata in the Indian city? Without going into a long historic discussion of this issue (one that has been written about extensively), let me offer the few points that emerged that struck me as interesting. Shailesh Pathak from SREI, who has many years of government service behind him, offered an interesting thesis. One that surmises that the growing importance of cities threatens the existing political establishment. Therefore, despite the 74th amendment, attempts to convert to systems where the Mayor is directly elected and therefore a powerful representative have actively been reversed or suppressed. He offered Maharashtra as an example. Moreover, Shailesh also explained that the system of rotational reservation in city government ensures that councilors cannot stand for elections from the same ward twice in a row. It is therefore, we surmise, impossible to build a strong electoral base and commitment to a single ward and quite hard to get re-elected. This effectively prevents a class of city-level powerful political leadership from rising and MLAs and MPs can continue to be centers of power, often stepping in to give largesse or take decisions that councilors have been pushing for months without success. This sort of situation has been corroborated during my discussions with councilors in Gurgaon, including Ward 30 councilor Nisha Singh who was present at this morning’s meeting. Cities at present are seen by State governments as the proverbial milking cow. Sources of revenue, to be blunt, both above the board and largely below it! Given the short term view that politicians usually have (by definition, I might add), this revenue is maximized in the ‘growth’ phase of a city, when land is available to be urbanized, zoned as per a Master Plan and much money is to be made for those who have access to this privileged information beforehand! Even above the table, money is to be made building real estate and setting up infrastructure, providing services, etc. Once this growth spurt is over, governments (read politicians and bureaucrats) tend to lose interest in performing the mundane functions of governance and service provisioning, as there are no big bucks in this any more. In most cities across India, this is the situation. Of all the items that must be under the local government’s ambit, as per the 74th amendment, the most vital functions of urban planning, development control and infrastructure development are usurped by the State government using parastatal agencies like development authorities. The city is reduced to small functions, usually to be performed in a fractured landscape of jurisdictions. This is intensely frustrating for all those who operate at the city level (planners, bureaucrats, politicians, civil society, professionals, etc) and the general sentiment becomes one of cynicism and despair. We cannot continue to live this paradox in which cities full of energy, enterprise and promise are log-jammed into an uncompromising political scenario. Yet, every conference and talk you attend, every report that is released re-iterates this situation of extremes, but offers absolutely no solutions! Take for example, this news item. 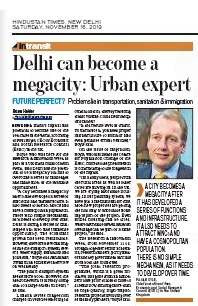 Paul Boyle, who heads UK-based ESRC, spins the big story about the future of Delhi’s development as a mega city even as he outlines nearly everything that contributes to life as we desire it (all sorts of infrastructure basically) as a ‘problem’! I find this sort of position absolutely ridiculous and a fallout of a vision that is only driven by economic development figures like the GDP without an eye out for overall inclusive growth. But the essential message is about the importance of the city as a driver of growth, which we cannot and must not deny. We have no choice but to ensure that cities function well given the trend towards urbanization that we cannot stem (another fact that the political class keeps turning a blind eye to). If cities in India need to meet their potential, it is pretty clear that some significant changes need to happen. In political mindsets, in legal and administrative processes, in institutional mechanisms and in the attitudes of urban citizens who must be more discerning and more demanding for a quality of life that they most certainly deserve.